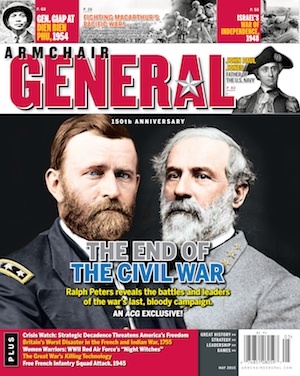 Mailbag | Armchair General Magazine - We Put YOU in Command! Armchair General readers enjoying sharing their thoughts, knowledge and opinions. By clicking on the links below, you can find samplings of their letters from recent issues. Sir, as an ACG subscriber, I was very proud to see that my Regiment was the Legendary Combat Unit for the January  issue. More. I’m writing to you for the chance to honor my personal history as a Puerto Rican soldier. More. In the Sept. 2008 issue of ACG on the Zulus [Great Warriors], it states: "Of all of history’s Great Warriors, none has surpassed the Zulus." Give me a break. More.